Thanks to Paul Bordoni at the Global Facilitation Unit for pointing us in the direction of this illustrated compendium of African recipes, including this one involving egusi, which are the seeds of various cucurbits. A somewhat confusing (to me at least) article on SciDev.Net promises a new African collaborative initiative on plant breeding in the title, but delivers something quite differentÂ in the text. It seems that a network is being set up in East and Central Africa to promote the adoption of tissue culture for conservation, multiplication and exchange of genetic resources, presumably mainly of vegetatively propagated crops. Dr Mary Taylor of the Secretariat of the Pacific Community’s Regional Germplasm CentreÂ has recently organized a similar network in the Pacific. Perhaps the two networks could collaborate? I’m still trying to get my head round this one. USDA scientists are developing a soybean variety (which they stress is not genetically modified) bred to remove nitrogen from the land. The variety does not develop nodules, the little bumps on the root that house nitrogen-fixing bacteria. Now those nitrogen-fixing bacteria are one of the best reasons to plant legumes, because they boost soil fertility. Why would you want a legume that did not? So that animal producers could use it to solve their waste problem. I expect it makes sense in the hyper-specialized world that the USDA serves but, as I said, I’m having a little trouble with the idea. 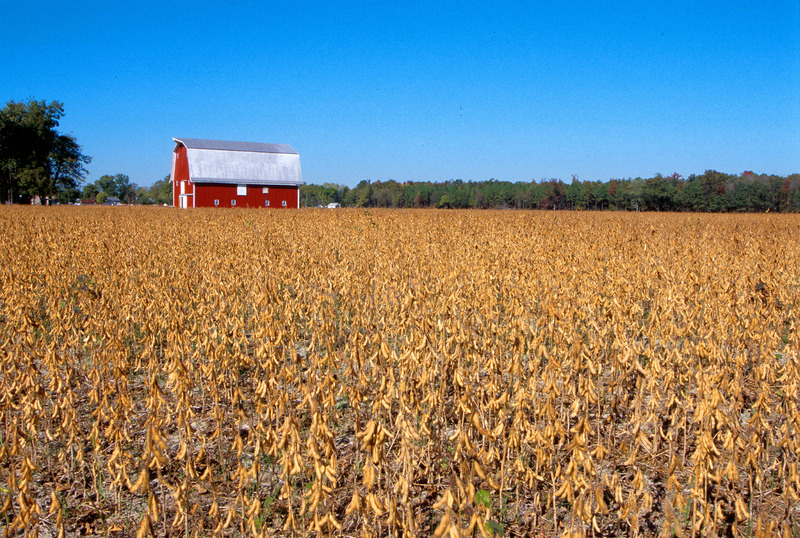 Photo of soybean field courtesy of USDA. We normally blog production aspects here; for a change, go read the food diary of someone who decided to try and eat as much hemp — for the omega 3 oils — as she could. Committed consumers are clearly useful, as is good marketing. But the final conclusion seems to be that timing is everything. It is an article of faith that intensive monocultures of genetically uniform plants are bad for biodiversity, wild and agricultural. So news that Malaysia is putting some money into a “Palm Oil Wildlife Conservation Fund to promote ideas and proposals to enhance biodiversity linked to palm oil production worldwide” is welcome. The fund will seek to promote sustainable practices and to make more use of the production of palm oil plantations, in addition to boosting biodiversity in and around plantations. There’s also talk of using palm oil to produce biofuels, a hot topic at the CGIAR Annual General Meeting.